Share the post "Costumes for the Whole Family at Party City"
There’s nothing more inspiring than the exuberance of the autumnal season! I love when the lush green leaves slowly fade to colorful orange and yellow carotenoid pigments, as well as crimson red and deep purple anthocyanins; autumnal scents wafting in the air, and the feel of the cool, crisp air. The autumnal season also means that my favorite holiday is quietly lurking around the corner: Halloween! I’ve always looked forward to dressing up for Halloween since I was a young girl. I loved standing out in unconventional costumes like a ghostly bride or majorette amongst a sea of princesses and superheroes. I may be an adult now, but I still love to get into the spirit of the spookiest time of year by dressing up! It’s the perfect way Party City for my children and me to bond as a family while having fun. This Halloween, we’re making Party City our one-stop destination for exclusive Nickelodeon costumes and accessories that will make it easier for the whole family to get involved. My family and I were in awe of the TMNT costumes, but it was instant love for my daughter when she first saw the SpongeBob Tutu Dress while we were scrolling Party City’s vast selection online. That love was inextinguishable the moment she first tried on the costume shortly after it had arrived in the mail. 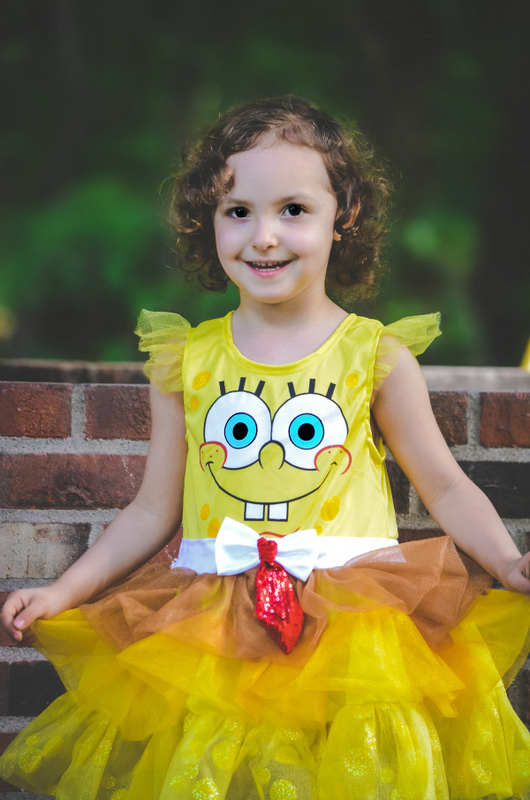 The SpongeBob Tutu Dress is effortlessly chic and comfortable. SpongeBob’s smiling face adds a playful spin, whereas the sheer yellow tulle on the shoulders as well as the brown and yellow tulle skirt adds a touch of sophistication. I also adore the sequin tie that is adorned at the waist.I plan on purchasing the matching accessories like the SpongeBob Footless Tights, SpongeBob Slipper Shoes, and SpongeBob Tiara to give the costume, even more, pizazz. Make Party City your one-stop destination this Halloween as well, especially if you’re searching high and low for costumes for the whole family! What a cutie and who knew you could get a Sponge Bob costume for a little girl. Adorable! I have never shopped at Party City but I may just have to check it out. That Sponge Bob dress is amazing. I want one in an adult size. Lol. She is so adorable! This Sponge Bob costume is fantastic. I will have to go to Party City to find costumes for my family. It looks like the kids love their costumes! I love Party City! lauren happel recently posted..10 Free Photo Cards at Shutterfly! We aren’t big into Halloween but we usually hit up party City after the “big day” so we can pick up some dress up clothes for the kids. They have the best selection hands down and we never have to worry about the quality. The hubby and I are going to a Halloween party this year so we will have to check it out for a cute couples costume. Party City is where I ordered our Halloween costumes too for our first Halloween ever here in the U.S. That spongebob tutu costume is so cute! And she’s so cute too! That is a super cute costume! My daughter needs more comfy choices for costumes since most of them are too itchy for her sensitive skin, thanks for the recommendation! 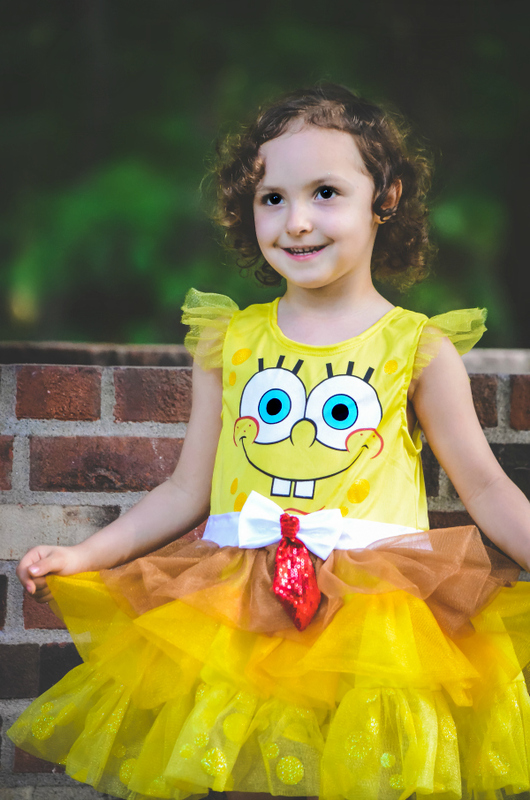 How adorable is that Spongebob tutu (and your little girl, of course)! Party City sounds brilliant! 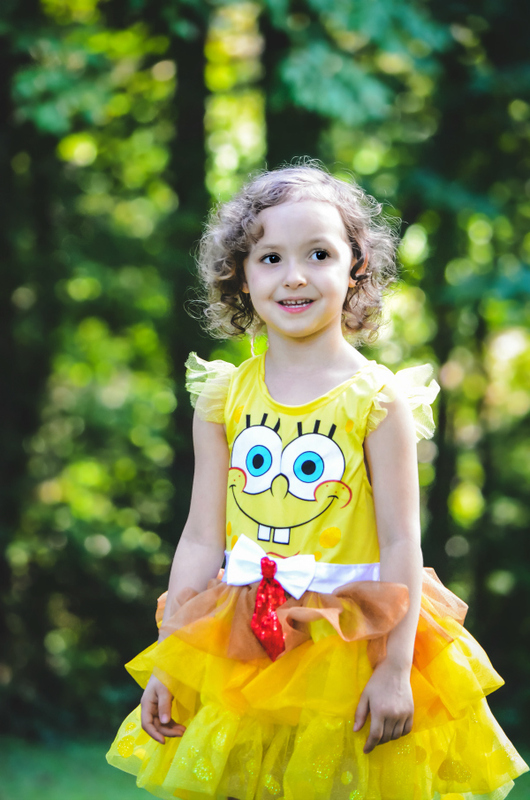 I like the sound of a Spongebob costume for a little girl because who doesn’t love Spongebob? I dont even think there is a Party City near me. But, I have shopped there when I lived in Boston and loved the variety! Gotta think about my Halloween costume! Its coming up in a minute! I’ve never thought to get my kid’s costumes from Party City! Your daughter is too cute! There is nothing like a costume that makes you feel pretty and funny at the same time. A darling, darling model! Oh she is the cutest Sponge Bob EVER!!! I think I would have to give her a whole handful of candy. She is so adorable! Yellow suits her. The Sponge Bob costume is so cute, I’m sure my twin granddaughters would love this. 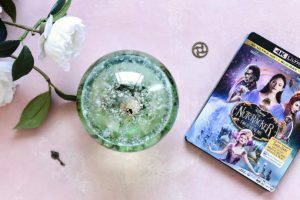 OurFamilyWorld recently posted..This Butterbeer Recipe is Perfect for a Fantastic Beasts and Where to Find Them Party! That’s so cool I hadn’t Sponge Bob Costumes for little Girls, good to know party city has them! Aww, I love her Spongebob costume, so adorable! We love party city for all of our birthday and holiday needs! What a clever costume idea after some of kid’s favorite character. She looks adorable and loves it! This spongebob dress is absolutely adorable! You daughter looks cute in it too! It’s always nice to surprise kids with things like this that allow them to enjoy their favorite characters more! She looks so adorable! We love Party City for birthday party shopping! My little guy turns 3 on Halloween and I know we’ll be stopping by there! I was shocked at the selection they have! Octonauts for my 3 year old blew his mind. I will seriously be buying there from now on especially the ones I had no idea even came in a costume! I love that Spongebob costume and it looks great on her. Aww I love her little Sponge Bob costume! My kids have been obsessed with that show lately! We’ll have to go check out their costumes. she is SO stinking cute. I love it! And I love spongebob. Hubby and I got lots of our Halloween costume supplies at Party City this year! We love Party City! In fact we were just there to get supplies for my youngest daughter’s second birthday. So many great themes. That little Spongebob costume is adorable!!!! We purchased an Elsa costume for my little girl (she just turned two). I love that the dresses they have are so sparkly (and all the tutus). Your little one is a cutie!!! 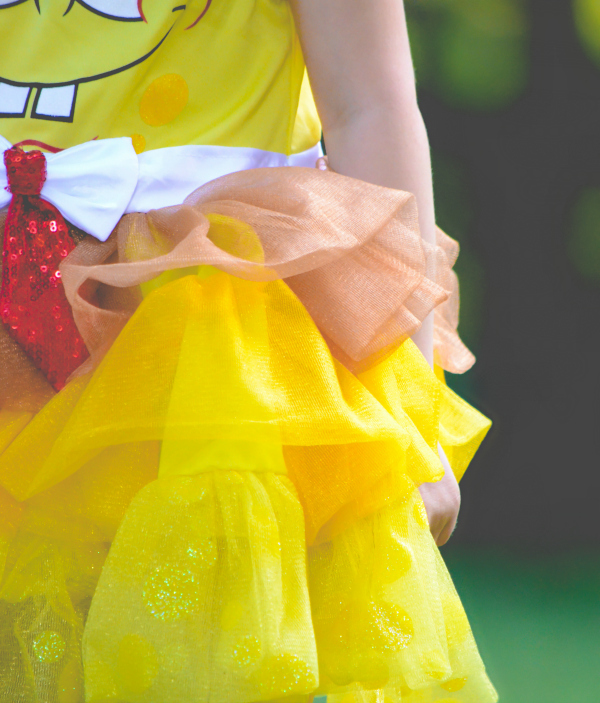 You daughter looks adorable in that SpongeBob Tutu Dress! I can definitely see a bit of you in her eyes! Omg what a cute costume!!!!!! My daughter would love this since she is sponge bob obsessed!!! Oh I am loving her costume!!! What an adorable Sponge Bob! We love shopping at Party City for Halloween and party needs! We love party city for costumes. My daughter had a My Little Pony birthday and we got her a dress there for that. My son was just telling me that he wants to go to Party City to get his costume since they have a huge selection. I’m going to have to take him this weekend since I am way behind schedule on our Halloween preparations. I love making my own costumes but I could see me looking online eventually for my kids. (None yet – one arriving in February!) I love the selection that Party City tends to have and your daughter definitely picked out a cute one! Party City is one of our favorite places to go for multiple different occasions. Her costume is so adorable!